Be the first to share your favorite memory, photo or story of Nikita. This memorial page is dedicated for family, friends and future generations to celebrate the life of their loved one. 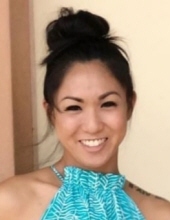 Nikita “Niki” “Kita” Tamiko Graham of Honolulu, went home to her Heavenly Father on Thursday, January 17, 2019 at the age of 32. A child of God, she is survived by husband Bryce Graham; sons Chauncey and Caleb; parents Jody and Tammie Kotani; brothers and sisters: Jordan Kotani, Tania (Brandon) Morimoto, Brandon (Maria) Teruya, Ashlyn Kotani and Natasha (Evan) Nakatsuka; grandparents: Alfred and Glory Ann Connolley, Steven Lucas and Natty Gabriel; Betty Kotani, Judy Takano and father Lance Ifuku; In-laws: Tommy and Hedy Graham; Blayne (Tillianne) Graham; tons of nieces, nephews, aunties and uncles; Word of Life Christian Center family and predeceased sister Nicki Kotani. Nikita was our special angel who loved the Lord and brought many to know and love Jesus. Since her childhood years, she always put others first, the homeless, the lonely, the needy, and prayed for everyone’s happiness. She had a personality that would light up the room with her lively spirit, presence, laughter, singing and much more. She was one who persevered through life’s highs and lows. She leaves a legacy of not only saving souls but saved lives by giving a gift of life to a liver recipient in Washington and two kidney recipients in Hawaii. She was our beautiful angel who left her temporary life on earth and is joyfully rejoicing with eternal life in Heaven. Family requests no floral wreaths. "LOVE FREELY & GIVE WHOLLY"
To send flowers or a remembrance gift to the family of Nikita Tamiko GRAHAM, please visit our Tribute Store. Scattering of partial ashes immediately following at Tracks beach in Nanakuli. "Email Address" would like to share the life celebration of Nikita Tamiko GRAHAM. Click on the "link" to go to share a favorite memory or leave a condolence message for the family.